The template is built with T3 Framework and Bootstrap 3, compatible with our great extensions: EShop, Events Booking, Membership Pro and EDocman. It is 100% responsive and easy to customize, no coding required! 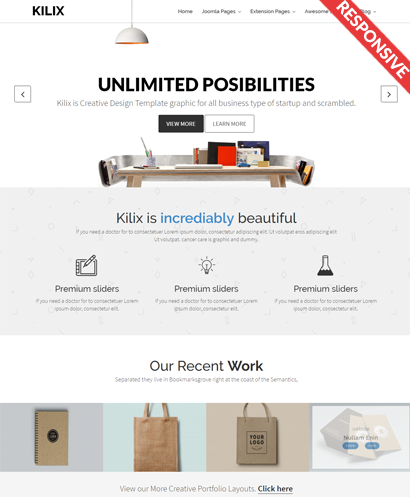 Kilix is a multipurpose Joomla template which comes with 3 different homepage layouts. You can use any of them to for your homepage. So with these different built-in layouts, you can use Kilix for multiple different purpose: Business, Portfolio, Corporate, Ecommerce, Events Booking, Education, Membership, Travel, Company, Reservation, etc. Kilix Joomla template is built with latest T3 Framework and Bootstrap 3. T3 Framework is a powerful template framework from Joomlart. With T3, you can customize the template as the way that you want easily. Kilix is a fully responsive Joomla template. It allows automatic re-sizing the web page to fit all desktop monitors, tablet and mobile screen. Kilix is also user friendly Joomla template and compatible with all of general web brwosers as FireFox, Google Chrome, IE, Safari, etc. By using Kilix template, now you don't have to worry about how your site looks like on different devices and web browers. They are simple same and perfect! With Kilix, you can build the site as the way that you want easily by changing style, layout, colors via Theme Magic from the configuration of the template. Kilix supports both of Megamenu navigation system on the desktop and Off-Canvas menu on the mobile and tablet devices. You can manage and built the menu system by yourself easily. Kilix supports all the default Joomla pages: Login, Smart Search, Search Results, 404, Blogs, Contact Us, Our Team, etc. Kilix also suports standard style for all the default Joomla modules: Login, Search, Recent Posts, Contents, Tags, etc. So if you are building a website with one of these our extensions and need a high quality template, Kilix template is a best choice for you. For starting 2019, we released version 2.0 of Kilix template with many great big improvements. 1. Big improvements of loading speed on both of desktop and mobile devices. 2. Fix some problems with menu system to make it run smoothly. 3. Review the font of whole of sites and make it looks perfectly. 4. Compatible with latest Joomla version and T3 Framework. 5. Fix the problem with slider modules. 6. Review and improve style layouts of all 4 extensions: EShop, Events Booking, Membership Pro , Edocman to mark style of template. 7. Fix all of bugs / issues which were reported by existed customers. 4. Add New Styles for Footer. 1. Fix some small issues on layout of extensions. 2. Improve some custom HTML modules.